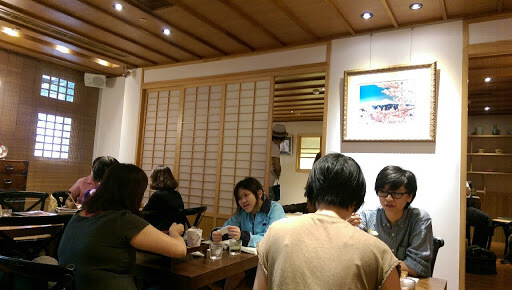 The area around ShiDa University is a busy area packed full of Taiwanese and also foreign students. The nightmarket is very popular, and the streets come alive with smells from 6pm onwards each day with ShiDa road playing a huge role in accessing this exciting place. Only around 6-7 tables make up the inside, with 3 private rooms that can be booked in advance. The private rooms are arranged with a traditional Japanese feel, with shoes left outside and the table closer to the floor whilst you sit on a cushion. Arriving in this bamboo bowl, was this little beauty: a scoop of green tea ice cream, generous helpings of green tea jelly, 3 soup ball dumplings and a good portion of red bean. Ice cream: The ice cream has a very deep green tea flavour, and is slightly bitter. Unlike many ice cream, it is not sweet. But it doesn’t suffer for that at all. 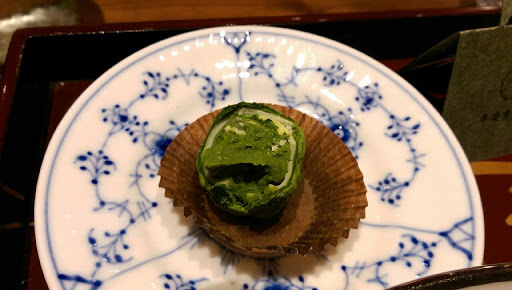 Coupled with a strong taste of full fat milk, the ice cream oozes with depth of flavour and allows the green tea to really speak for itself, with what seems like very few other ingredients. 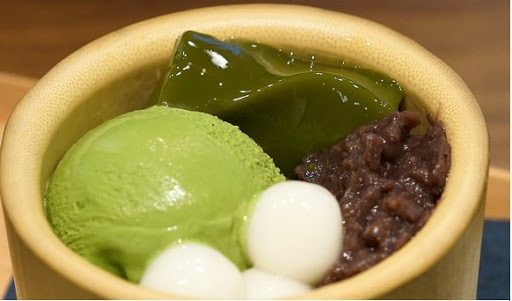 Green tea jelly: Once again, there is a strong taste of green tea. But this time, it isn’t as rich or creamy as it isn’t coupled with the milk. The jelly is quite soft and almost silky in consistency, and melts in your mouth. 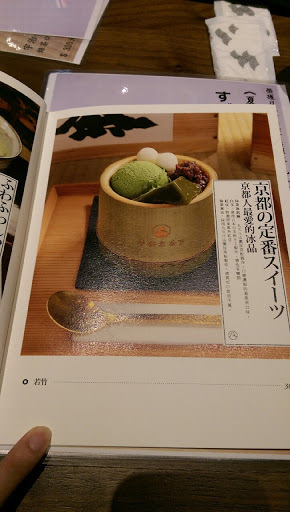 The taste of the green tea is wonderful, and comes across a lot sweet than in the ice cream. Red bean: Being such a popular ingredient in Japanese cooking, you can see why. It adds a grounding to a dish, and earthiness that is needed when some flavours become too predominant. Lightly sweetened, it contrasts the flavours and textures of the ice cream and the jelly really well. Soup ball dumplings: I don’t get it, I really don’t. 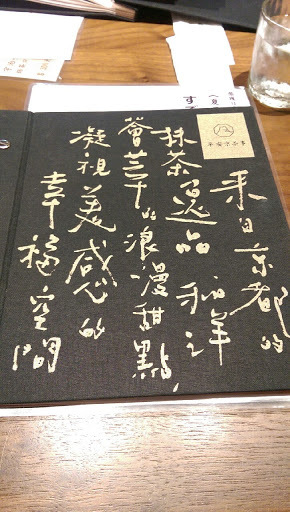 I am looking for a good bowl of sweet peanut soup with soup balls (花生湯圓）then that’s what I’ll order. But I wasn’t, so I didn’t. Without ordering the soup, I still ended up with soup dumplings. It’s weird and I don’t like it. It upset the balance of the dish, I feel. All it added was texture. But, really, I already have jelly, ice cream and beans in one dish. Why do I need a tapioca like substance added into the mix? I don’t. This was unreal. Really, this was something very special, indeed. I have had a fair amount of this style of cake before: lots of layers, with a cream or mousse in between a little like a mille feuille. 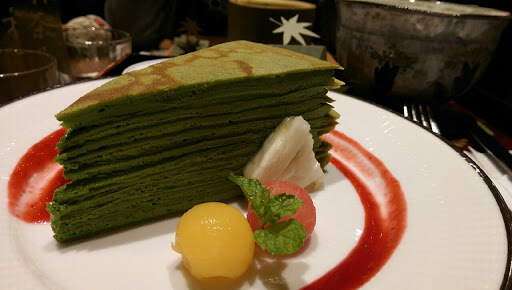 But this one took the biscuit: 11 layers of green tea pancake, delicately thin, separated sumptuous layers of bitter green tea mousse. Plunging the knife or fork into this creation seemed almost too difficult at the start because you just know that it’s all going to be a huge mess on the plate from that point onward; totally worth it! As predicted, the mousse oozed out on both sides as you put the knife inside and you feel yourself cutting through all of those 11 layers. Inside the mouth, it remains impossibly moist with an overwhelmingly beautiful flavour of strong green tea. Coupled with the raspberry smear on the outside of the plate, this dish ranks well up there in some of the best dessert I have had the pleasure of tasting (and I have one hell of a sweet tooth!). 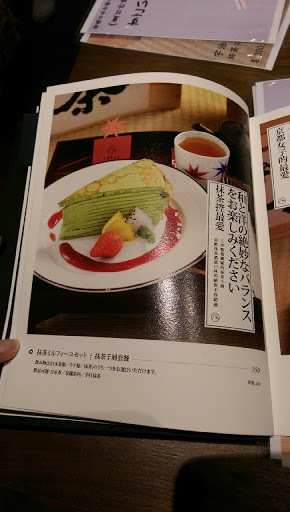 Pairing this cake with the green tea could perhaps put off the non-green tea drinkers out there. Fortunately, I am a huge fan. I’ve been really lucky, living in Taiwan, to have tried some fantastic teas. With a big Japanese influence, too, I have been fortunate enough to try some impressive green teas. Kyoto (京都）is widely appreciated as one of the best green tea’s in the world and, as this is from Kyoto, I feel privileged to have drank this. 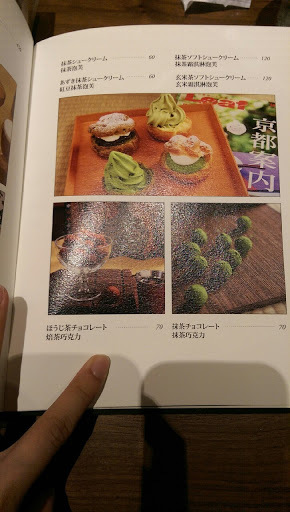 This style of green tea is done as a powder form. So the powder is added to the cup first, then the water on top. A special wooden whisk is used to incorporate the tea powder into the water, however, it will not dissolve as processed coffee granules (for example) will. It will, instead, turn the water into a thicker consistency and line the bowl/cup as you drink. It is bitter to the taste, but it has a very unique taste which is truly special to this style of green tea. If you haven’t, you must try it! 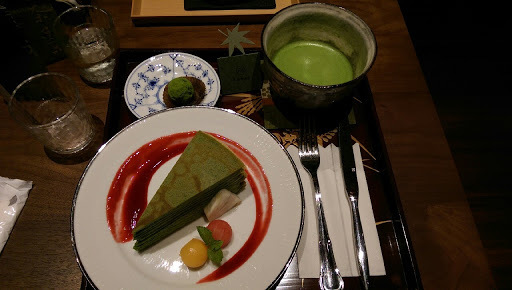 We chose to add a green tea chocolate to the plate. It came with the layer cake dish, and you can see it as the small dish in the back left corner. Working from the outside in, you can see the chocolate has been rolled in green tea powder when still warm, as the powder remains stuck to the chocolate. The next layer is of white chocolate. I had not expected white chocolate, but really, it makes perfect sense: green tea is inherently quite bitter, therefore a sweeter chocolate would be an ideal pairing, ergo: white chocolate. Encased with the white chocolate rolled green tea egg, lies a smooth green tea mousse. A little sweet and a little bitter but absolutely no evidence of a grainy mousse at all = winner. The chocolate was very good, but not worth the $70 for a single chocolate. 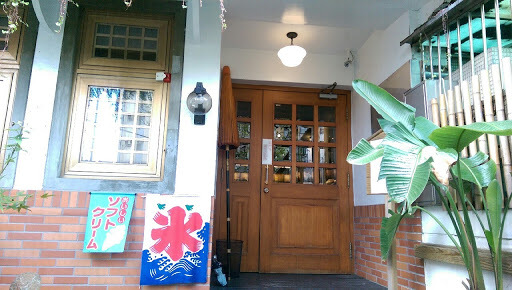 Overall, the service was fantastic, the atmosphere was homely and pleasant and the food was wonderful. 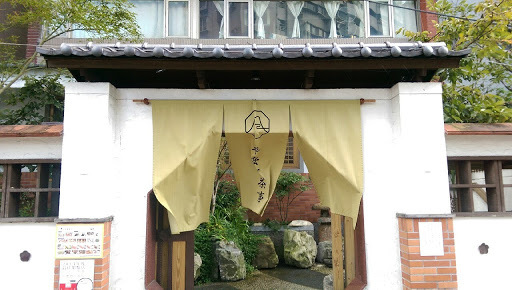 I am already looking forward to going back, maybe with more people next time so I can drink more tea! Best dish: 2. 千層 qian1ceng2 Green tea layered cake. Not only the best layer cake I have had, but well up there with one of the best desserts – flawless. Dish I wouldn’t order again: 3. 抹茶巧克力 mo3cha2qiao3ke4li4 Green tea chocolate. On the menu there is a picture of 9 chocolates, but in reality you get just 1. Whilst the taste is superb, it is not worth the $70/1 price tag, for me.